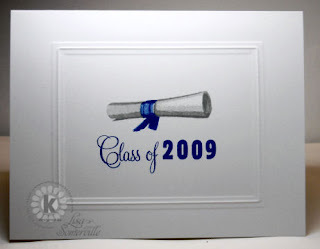 Happy Bloggers Challenge Friday - it's that time of year - Graduation. I think just about everyone has a least ONE Graduation Party to attend, and I'm sure as always the Bloggers Challenge Players will inspire you with their creations. Tan Mat 8-1/2" x 5-1/2"
White Card Stock 8-1/2" x 5-1/2" (scored at 4-1/4"
Since I needed to make quite a few of these, I embossed all the white card stock, then stamped the sentiment. Then went back and stamped all Step 1 of the diploma, following with Step 2 - 4. It was a lot faster to do all the cards in each step, then go back and repeat with the next step, then completing each card individually. Have a great weekend! Be sure to click on the Bloggers Challenge Logo on my sidebar to see what the other players created this week. This is so crisp and clean looking...very elegant! Nice clean lines, Lisa. Well done! TFS! I am loving this layerless look. It really makes the focal image stand out!! Gorgeous!! I have recently found a renewed appreciation for CAS cards. Stunning, Lisa! Love the CAS look here. Congrats on your graduate too! Wow! This is nice. It looks very professional with the embossing. Wow, Lisa, love the clean and crisp look of this gorgeous card! Wow! Very elegant and sophisticated--love it. Congrats to Joey!!! Beautiful! Simple, classic, elegant....it's just fabulous! Love the look of the embossed frame! Simple and beautiful. I love the dry embossed lines. it really makes this a work of art. Your work is so beautiful. Great Job Lisa! Stunning! WOW, so eye catching!